Action little cigars are one of the finest, most affordable filtered cigars that have ever stepped onto the boundaries of the tobacco market. 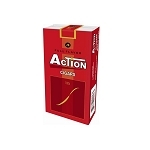 Action filtered cigars offer tobacco that is indeed standalone in its nature of being affordable and well priced for those seeking tobacco products in its class. If you are browsing for compact sized little cigars, Action cigars are indeed the answer. Action filtered cigars also come in a number of different flavors: full flavored, menthol and light. When you add the pricing reduction and discounts offered by Tobacco General with the standards based upon affordability offered by Action little cigars, your byproduct is simply breathtaking- a combination of simply fathomless low prices!